The final bill is linked to this post. The details below refer to an older bill. When trading in an old car for a new one, what gain in fuel efficiency is needed to yield a net reduction in CO2 emissions? This question lies at the heart of whether a Cash for Clunkers bill will help or hurt US CO2 emissions. We argue for a 1 GPM principle: A new car needs to save 1 gallon of gas every 100 miles compared to the original car to be carbon neutral. The new car will then offset the CO2 emissions from its own production in 70,000 miles of driving, which would occur in 4 to 7 years for most drivers. Some of the trade in rules in the current Cash for Clunkers proposal do not meet the 1 GPM principle. The rest of this post provides background on Cash for Clunkers and an explanation of the 1 GPM principle. In general, Cash for Clunkers is appealing because it garners support from many constituencies. It spurs consumer spending, helps the automobile industry, and reduces CO2 emissions. All bills therefore must combine and balance these interests. Inevitably, however, bills force a tradeoff when it comes to the size of MPG improvements. Larger improvements yield greater CO2 reductions but limit the number of cars that can be purchased. Although the current bill has some desirable features from the perspective of CO2 reductions (namely, increased voucher amounts as MPG improvements increase), some of the MPG improvements are too small to yield a net reduction in CO2 emissions. Specifically, the bill requires 1 or 2 MPG improvements on "large light duty trucks" to qualify for a voucher. In some cases, this will yield less than half a gallon of gas savings over 100 miles of driving. For example, trading in a 15 MPG truck for a 16 MPG truck would qualify for the $3,500 voucher, but save only .4 gallons of gas every 100 miles. This earlier post summarized Bill Chameides's analysis of the MPG gains needed to "cover" the incremental CO2 emissions when producing a new car. After reviewing several sources, Dean Chameides found that producing a new car emits about 7 tons of CO2. Given that burning one gallon of gas emits about 20 pounds of CO2 and that a 15 to 16 MPG saves .4 gallons per 100 miles, it would take 175,000 miles of driving for a 15 to 16 MPG improvement to offset the CO2 from producing the new car. (And, under the compromise bill, a 17 to 18 MPG improvement would also qualify for $3,500 and yield even smaller reductions in gas savings and CO2 emissions). In the current bill, efficiency improvements are expressed as fixed MPG improvements. Because gas consumption has an inverse relationship to MPG, the same size MPG improvement yields different CO2 reductions depending on the MPG of the original vehicle. CO2 reductions are not a linear function of MPG improvements. CO2 reductions are directly and linearly related to improvements in gallons per 100 Miles (GPM). The following proposal uses GPM to argue for a minimum improvement in fuel efficiency that ensures carbon neutrality (or better) in the process of replacing one car with another. Because burning 1 gallon of gas emits 20 pounds of CO2, new vehicles need to save 700 gallons of gas compared to old vehicles to remain carbon neutral. The 700 gallons do not need to be saved at once, but they do need to be saved during the lifetime of the car, and ideally faster--they should be thought of as replacing the remaining time and miles from the original vehicle. Note that the 1 GPM principle describes the absolute minimum gain in efficiency that should be rewarded. Ideally, larger vouchers would then be tied to multiples of these MPG improvements. The requirements described in yesterday's compromise proposal largely achieve the 1 GPM principle for cars and light trucks; however, they fail to achieve the 1 GPM for large light duty trucks and work trucks. This is where revisions to the compromise need to focus. Of course, the average car buyer (and voter) probably looks at a 2 MPG gain and thinks it is worthless. 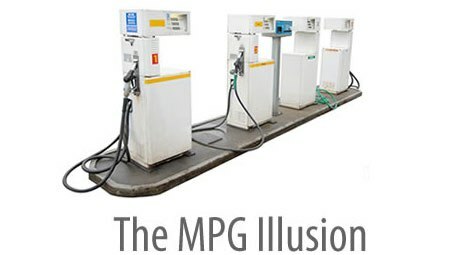 The surprising insight revealed by GPM is that small MPG improvements on really inefficient cars can save a substantial amount of gas (e.g., a 2 MPG improvement on a 13 MPG vehicle). GPM helps us recognize which gains pay for themselves in carbon reduction, and which ones don't. The ideal bill would ensure that any trade in was at least carbon neutral. It would then reward trade ins based on the size of CO2 reduction by offering a tiered voucher system that increased with reductions in GPM (not increases in MPG! ).